I'm always on the look out for plants, or flowers, that look like they are something else. Not so much monkeys or ducks, as orchid flowers do in many a listicle, but other flora. In June this spray of purple flowers in our Tropical Glasshouse (fading a little by the time I photographed it on 27 June) caught my attention, briefly. 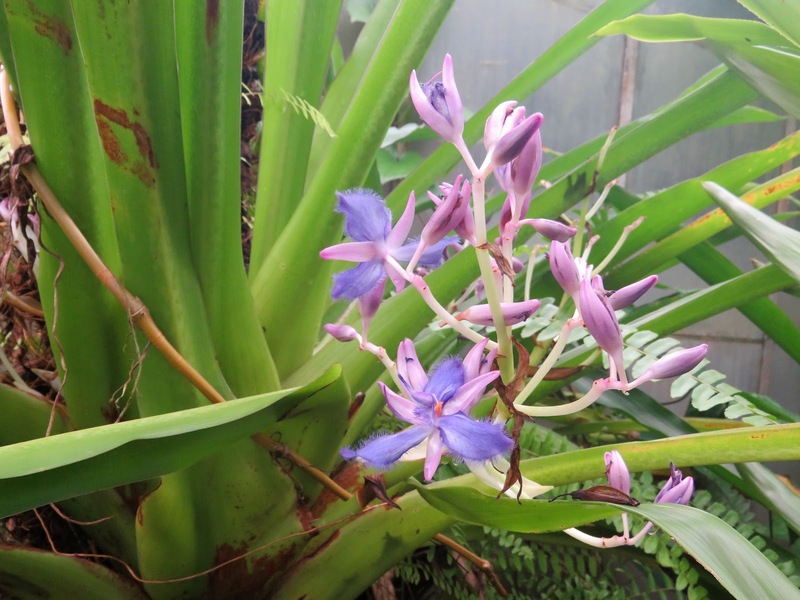 I dismissed them as some tropical orchid cultivar, pretty but inconsequential in the bigger botanical scheme. My sometime sharper-eyed (we debate our skills) colleague and friend Neville Walsh noticed it was something little odder than that. The flowers of Cochliostema odoratissumum do look, from a distance, like orchids. 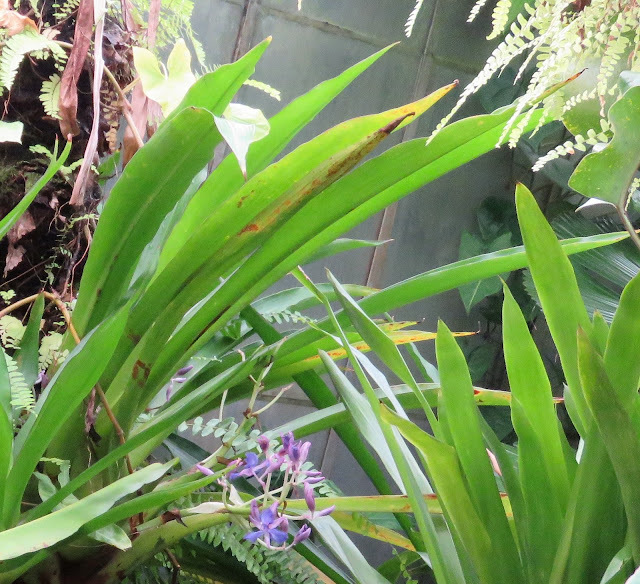 In leaf it is more like a bromeliad, right down to the water collecting tank in heart of the strappy leaves. As you have anticipated, it's neither an orchid nor a bromeliad. 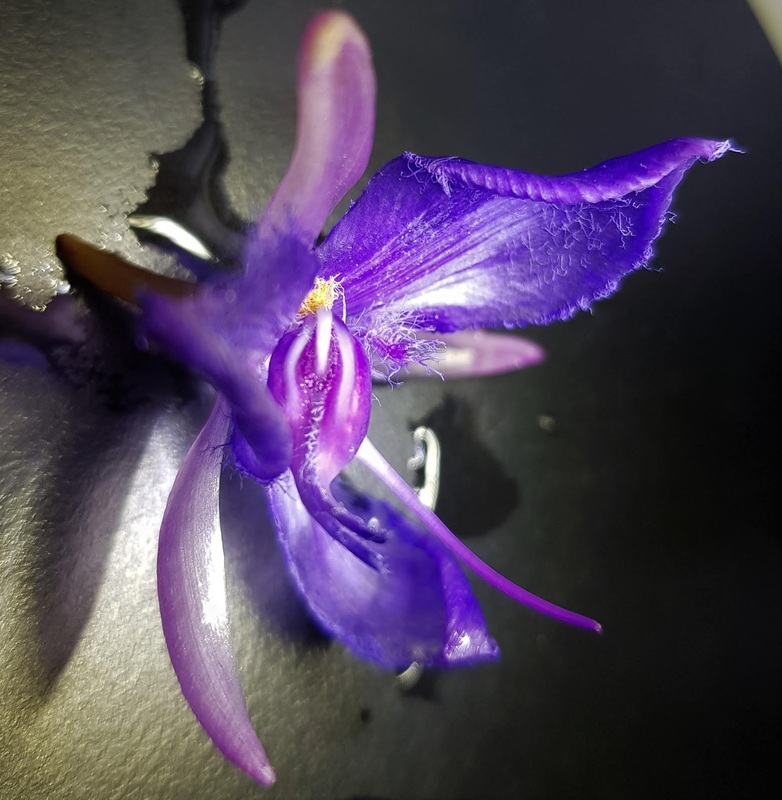 It is, rather, a member of the family Commelinaceae, hundled in with spiderworts such as Tradescantia, including the common weedy garden plant we sometimes call, dubiously, Wandering Jew. At up to 5 cm across, the flowers of Cochliostema are the largest in the family, as are the leaves of our species, reaching a metre long. There are only two species of Cochliostema: Cochliostema veluntina and Cochliostema odoratisimum, both from Central America. The flowers of both, and a couple of closely related genera, have fringed or bearded petals. As the species name telegraphs the scent is sweet, like cheap perfume - although whether I could distinguish cheap from pricey is doubtful. I'm not sure that a beard and cheap perfume qualifies this flower as a hipster but wasn't able to test the plant's barista skills. 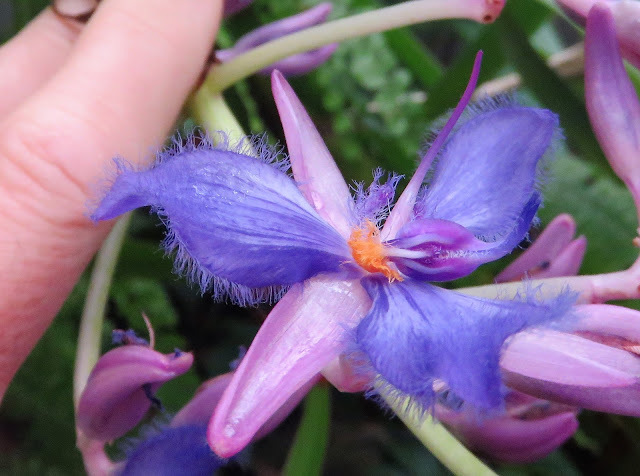 As you can see from the top picture, the essential bits of the flower are in threes: three outer parts (pale purple sepals), three vivid blue petals and ... well, an oblique, cowry shell shaped vessel extending into an anthropomorphically rude gesture. 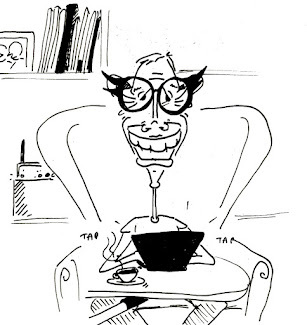 Maybe it's better to illustrate, here in close up. 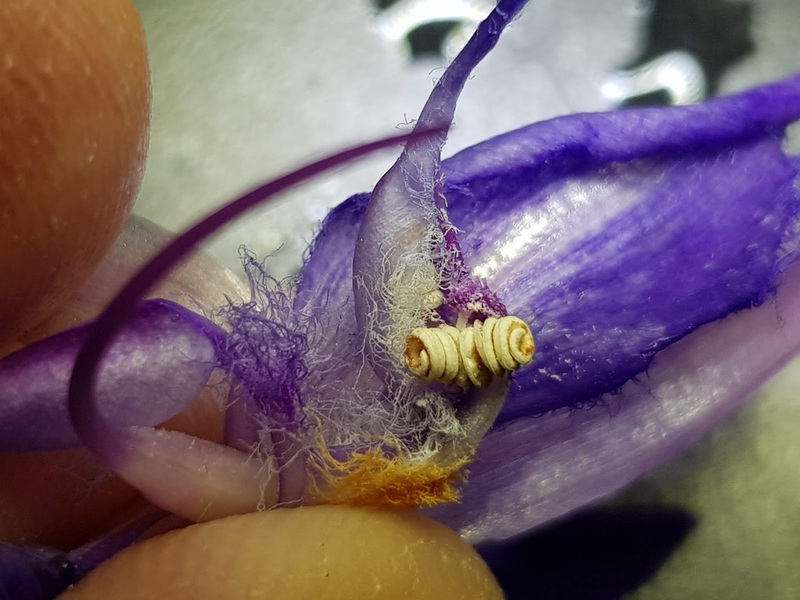 The cowry shell case is made from the fused, flanged (petaloid) stalks of two of the anthers, with the third providing just a small flap in the picture above. Teasing (ripping) apart the flower reveals some weird goings on. And thanks to Christopher Hardy and Dennis Stephenson, I can make some sense of it. Look at these stamens (the male bits) looking like the filaments in an incandescent light globe! Without pealing apart a beautifully contoured casing you don't even get to see them. Along with three of these coiled anthers there are also three inactive stamens, called stamenodes. The three female bits are also fused, with eggs in a swollen white base to a long purple thread. You can see the fused ovary in the picture above, heading off to the left from my lower finger. 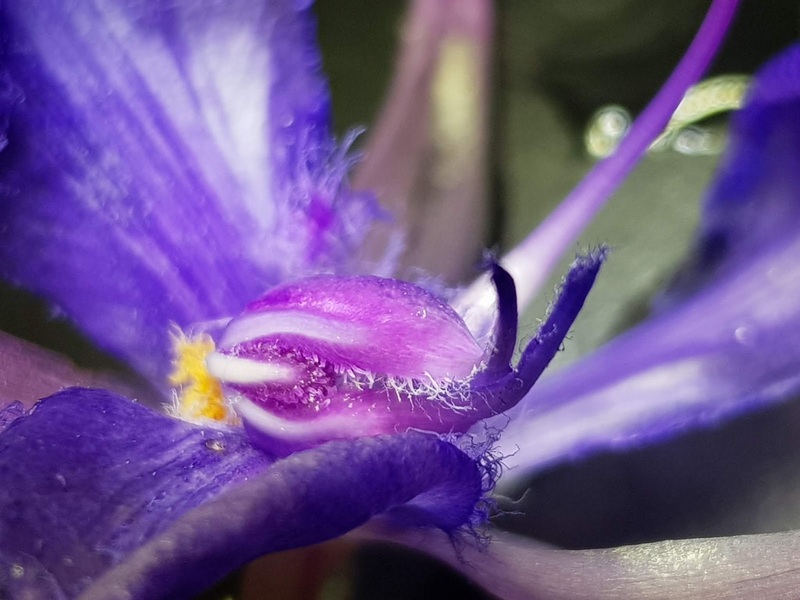 The purple thread is evident in the next picture of a whole flower, heading out to the bottom right. So how does it all work? The pollinator , a bee I gather, must have to force some part of itself in through a narrow opening to get to nectar, and in so doing brush against the anthers and gather pollen. This pollen would then end up in another flower, on that long style which may also bump against the bee as it maneuvers around the flower. Sadly I have no way to check this out in our Tropical Glasshouse far from Central America and far from its pollinating insects. Would the shape of the parts also give a likely description of what the pollinator might look like? Yes flower design can help. That, plus the colour - blue - suggests insects of some kind. Perhaps butterflies?